Brother HL-2270DW needs toner… HACK! Some time ago, I got a Brother HL-2270DW printer from NewEgg. The price, the ease of configuration and the performance were all excellent. Let’s be perfectly clear, I don’t print a lot – maybe an average of 15 pages per week. So when the toner light started flashing, I figured I could keep going for a few months, right? I mean, any self-respecting geek knows you don’t replace the toner until the print is completely faded. And even then, you take out the toner, shake it a little, and get 30 or 40 more pages. So I was astonished to have the printer just STOP on me, after printing 6 of 9 pages of a PDF that I really need. While digging around on the web a little, I found a youtube hack using straws and fun tack. No thanks. 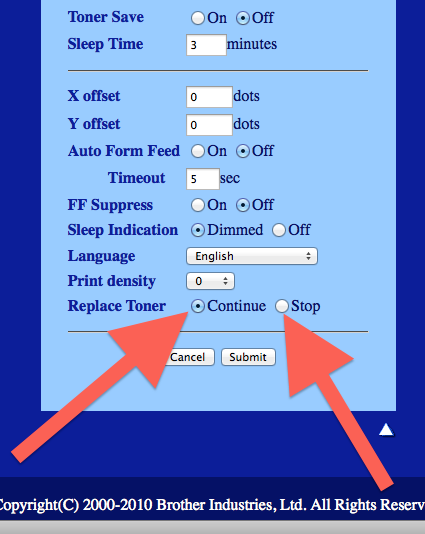 But there was a great comment in there, that suggested going to the web interface and reconfiguring the toner settings from STOP (which is the default) to Continue. Wow… cheeky buggers. They must really want to sell more toner cartridges. So problem #1, how do you find the printer? I used a great utility called Angry IP Scanner which showed me all the “live” IPs on my WiFi network. After using my web browser to hit a few unlabeled IPs, I found it. Problem #2, logging in: FYI, the default login credentials for the Brother HL-2270DW are: u/admin p/access . If you set yours and don’t remember it, reset the printer settings and that will restore the defaults. You may have to go fish for the IP again though. OK so there. Have fun. And don’t wait so long to get new toner next time.